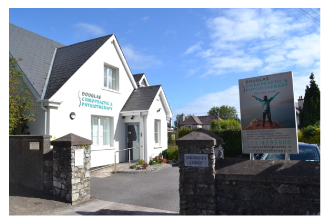 Established in 2001, we are Ireland’s first combined chiropractic and physiotherapy clinic, treating pain for people of all ages in Cork. We pride ourselves on providing a warm, comprehensive and friendly clinic. The Douglas Chiropractic & Physiotherapy Clinic is an architect-designed, custom-built facility including 6 treatment rooms, an X-ray practice and a Pilates studio. We are located at Endsleigh Lodge, Douglas Road, Cork (to the right of the bus stop opposite Maxol Garage on Douglas Road). Car parking is available on site and the bus stops to/from Cork City centre (207, 216, 220 and 223) are a stone's throw away!